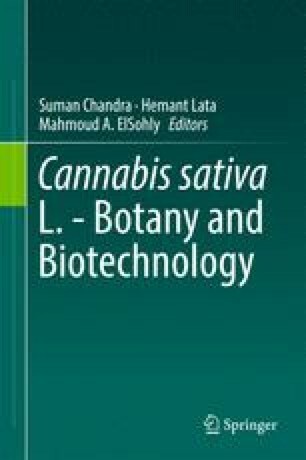 The formal botanical taxonomy of Cannabis sativa Linnaeus and C. indica Lamarck has become entangled and subsumed by a new vernacular taxonomy of “Sativa” and “Indica.” The original protologues (descriptions, synonymies, and herbarium specimens) by Linnaeus and Lamarck are reviewed. The roots of the vernacular taxonomy are traced back to Vavilov and Schultes, who departed from the original concepts of Linnaeus and Lamarck. The modified concepts by Vavilov and Schultes were further remodeled by underground Cannabis breeders in the 1980s and 1990s. “Sativa” refers to plants of Indian heritage, in addition to their descendants carried in a diaspora to Southeast Asia, South- and East Africa, and even the Americas. “Indica” refers to Afghani landraces, together with their descendants in parts of Pakistan (the northwest, bordering Afghanistan). Phytochemical and genetic research supports the separation of “Sativa” and “Indica.” But their nomenclature does not align with formal botanical C. sativa and C. indica based on the protologues of Linnaeus and Lamarck. Furthermore, distinguishing between “Sativa” and “Indica” has become nearly impossible because of extensive cross-breeding in the past 40 years. Traditional landraces of “Sativa” and “Indica” are becoming extinct through introgressive hybridization. Solutions for reconciling the formal and vernacular taxonomies are proposed. Arno Hazekamp is thanked for helpful discussions regarding this manuscript.